Can't make it to NYC for Carnival this Labor Day? No worries. You can immerse yourself in Caribbean culture a little closer to home in Washington, DC at the 7th annual Carifesta. Carifesta is a FREE Caribbean music and arts festival celebrating Caribbean-American heritage. 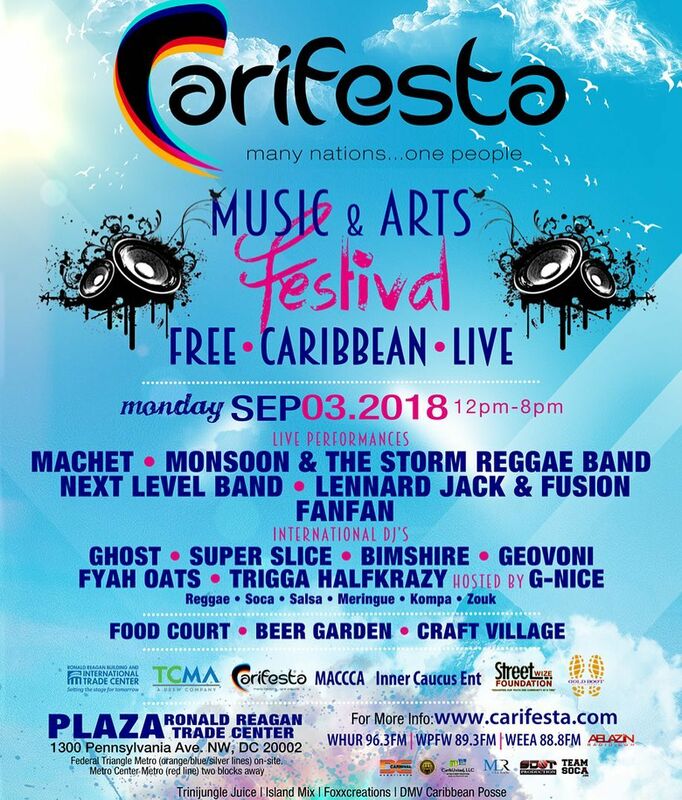 Carifesta will be held on Monday September 3rd, 2018 from noon to 8 pm in the Woodrow Wilson Plaza at the Ronald Reagan International Trade Center at 1300 Pennsylvania Avenue NW. There is parking available on the street and nearby, but I suggest that you be prepared to walk a bit if you arrive late. On the main stage, there will be live performances by Machet, Monsoon & The Storm Reggae Band, Next Level Band, Lennard Jack & Fusion and FanFan. There will also be international DJ’s spinning reggae, soca, zouk, kompa, salsa, and meringue. So bring your walking and dancing shoes. Bring your wallet too, because vendors will be out there selling Caribbean food too. There's a cultural village, kid's zone with face painting, and a beer garden as well. Cultural Village. For more information, visit www.carifesta.com.